Offers: Various Specials including Stay & Play promotions and discounts for groups of golfers. Contact club for detail. Wisemans Ferry Golf Club is part of the Wisemans Ferry Retreat. The Retreat is set in 50 acres of grounds and offers a range of facilities including the Riverbend Restaurant, Blaxland Health and Beauty Salon, a state-of-the-art conference centre, swimming pools and a 9 hole golf course. The course, designed by Terry Watson and Norm Carr, is a picturesque 9 hole par 34 course which runs along the banks of the Hawkesbury River and is surrounded by four national parks. The tree-lined fairways place a premium on accuracy and the use of alternative tees provides variety for the back 9. There are numerous bunkers and water hazards to test even the most experienced of golfer but without penalising the less acomplished player. 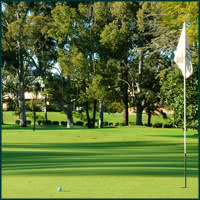 Although the course is flat and an easy walk, golf carts are available. Clubs and trolleys can also be hired from the golf shop. The course is open to non-members and visitors are always welcome.